These limestone structures along the Eagle Pass - San Antonio road at the Medina River ford were once centers of trade, travel, industry, and domestic life. Alsatian colonist Michel Simon settled here in 1844, followed by Caesar Monod, who built a one-story home and store with a separate kitchen in 1849. Within two decades, John and Rowena Vance had converted Simon's home into a wash house, built a new residence, and enlarged the store to include a two-story hotel. A mill was built on the river in 1854, which Joseph Courand modernized after 1876 and J. T. Lawler used for hydroelectricity after 1925. Ruth Lawler kept the tradition of hospitality at her "Landmark Inn” before deeding it to the State in 1974. Erected 1965 by Texas Historical Commission. U.S. 90. Touch for map. 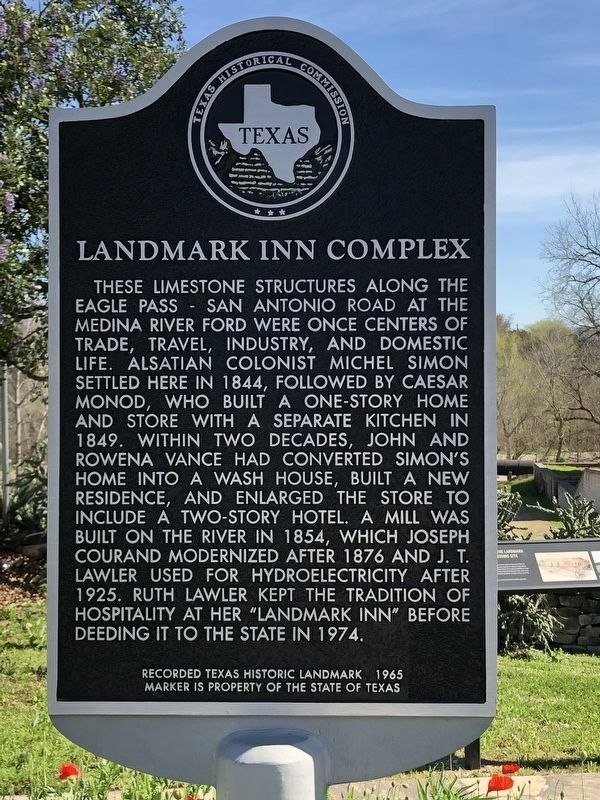 Marker is located near the parking area of the Landmark Inn State Historic Site. Marker is at or near this postal address: 402 Florence Street, Castroville TX 78009, United States of America. Touch for directions. Other nearby markers. At least 8 other markers are within walking distance of this marker. Vance Hotel and Store (here, next to this marker); Henri Castro (about 400 feet away, measured in a direct line); Zion Evangelical Lutheran Church (about 700 feet away); Site of the Homestead of Henri Castro (about 700 feet away); First County Courthouse (approx. 0.2 miles away); Moye (approx. ¼ mile away); Alsatians of Texas (approx. ¼ mile away); General Wool and the Chihuahua Road (approx. 0.3 miles away). 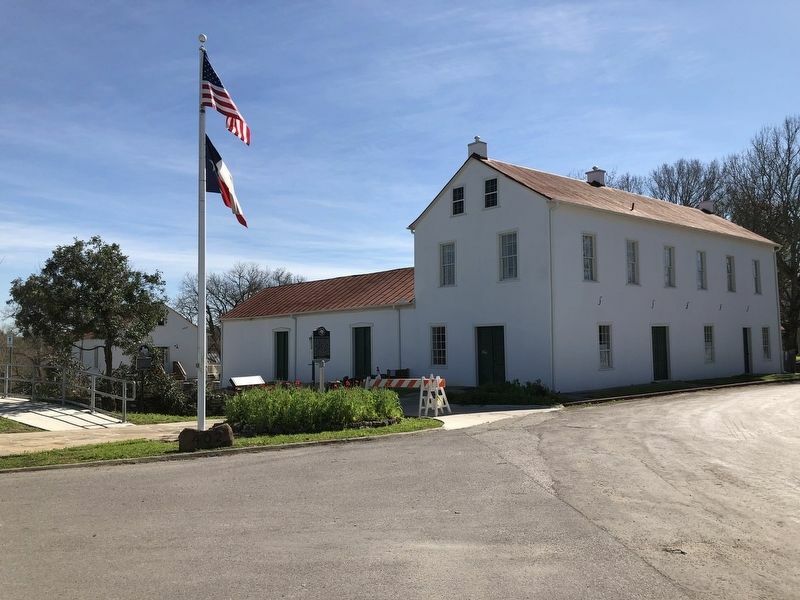 Touch for a list and map of all markers in Castroville. More about this marker. No record of this marker appears in the Texas Historical Commission's Atlas. Although it is dated 1965, the marker looks new and it is possible that this is a replacement for an older marker that was lost. More. Search the internet for Landmark Inn Complex. Credits. This page was last revised on February 27, 2019. This page originally submitted on February 27, 2019, by Brian Anderson of Kingwood, Texas. This page has been viewed 51 times since then. Photos: 1, 2. submitted on February 27, 2019, by Brian Anderson of Kingwood, Texas.